I will certainly not complain, but if there is a problem with having a Derby field as deep and talented as this one it's that it makes it hard to back a horse like this one that in most years I would really like in the Derby. He has a lot of development he needs to do between now and that race, but I have liked a lot of what I have seen, accept excuses for the disappointments, and think he could be sitting on a big race. I'm not convinced that he is good enough to beat the likes of American Pharoah, Dortmund, or Carpe Diem, though. So, Can Danzig Moon win the Kentucky Derby? I like him a little better than the oddsmakers do - he's 40/1 in early futures at BetOnline - but it is a very tall task he faces. At the right price, though, he could be some nice value underneath in exotics betting. Blue Grass Stakes: I am not sure that such a thing as a good second-place finish exists, but if it does then this would qualify. The horse settled well off the pace, stayed in his path confidently, and made a nice move down the stretch. The only problem was that he was up against Carpe Diem - and excellent horse that had a near-perfect trip. Danzig Moon was no match for Carpe Diem, but the rest of the field was no match for Danzig Moon, either. 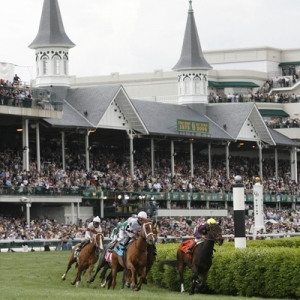 Since 1990 there have been 24 Kentucky Derby winners. Eleven of them won their final prep race before the Derby. Eight others finished second in the previous race. There is some hope here - though it is tough to imagine how he is suddenly going to get better than Carpe Diem - never mind the two Baffert horses that seem to be even better than Carpe Diem. Prior experience: the horse was off to a slow start - he twice tried to break his maiden in Kentucky last October and only finished second and fourth. After time off to regroup and grow up a bit he returned to action in February at Gulfstream and was an impressive winner in another maiden race. I was excited about him as he was making his stakes debut in the Tampa Bay Derby, but he was disappointingly flat. It came out after the race, though, that he was dealing with a virus that had not been detected before the race but which obviously affected him. He worked very well after the virus was cleared up, so the Blue Grass was, in many ways, just the first step back to racing form. He has shown a lot of promise and could be sitting on a big race. Probably not big enough, but big nonetheless. Trainer: Mark Casse has been named the top trainer in Canada seven times, including the last four years. He knows his stuff. He also trains Lexie Lou - last year's winner of the Queen's Plate, Canada's version of the Derby. He doesn't just stick to Canada, though. He races in big meets across the country and has for a long time - he won the training title at the Churchill Downs spring meet way back in 1988. He appeared in the Kentucky Derby for the first time in 2006, finishing 10th with Seaside Retreat. He has some very active owners, including John Oxley who won the Derby in 2001 with Monarchos and owns this horse, but this is his first trip back to the Derby since. Casse still needs his Triple Crown breakthrough, but there is no doubt he knows how to train - especially younger horses in big races. Jockey: Julien Leparoux has been on the horse the last three times out, and I suspect he will stay on. Leparoux hasn't been as sharp recently as he was in the past, but he has had all sorts of success riding at Churchill Downs and knows the track very well. He hasn't done better in Triple Crown action than a second in the Preakness and two thirds in the Belmont, but he has won five Breeders' Cup races, so he knows how to perform on big days. He's not as good at this point as some of the jockeys that will be on other horses, but the horse could certainly do worse. Breeding: There is some solid Derby breeding running through this horse's veins. He is the son of Malibu Moon. That horse is not only a son of stamina wonder-stud A.P. Indy, but he was also the sire of Orb, who won the Derby in 2013. Danzig Moon's damsire is, not surprisingly, Danzig. That horse's Derby connections are many. He is the grandsire of two Derby winners - Sea Hero in 1993 and Big Brown in 2008 (incidentally, Big Brown is the sire of potential Derby favorite Dortmund). Danzig is also the damsire of 2000 Derby winner Fusaichi Pegasus, 2003 winner Funny Cide, and 2012 winner I'll Have Another. Danzig is also a son of Derby winner Northern Dancer. I should also mention that Grandsire A.P. Indy is a son of Triple Crown winner Seattle Slew. Needless to say, there aren't a whole lot of concerns about the distance for this horse - at least not from a breeding perspective.